For modern operating systems, notably Windows 2000 and XP, more memory is a must have. While any system with a decent Pentium processor could run Windows 9x easily enough with 256MB of RAM, things are getting more demanding. 512MB of RAM should be considered the bare minimum for a new computer, and if you are using XP or 2000, more RAM will increase the performance of your computer. The trouble is, since RAM can have data written to and from it many, many times faster than a hard-drive, as soon as you start using virtual memory it will slow your system down while the data is retrieved. Hence more RAM equals less slowdown while opening applications, switching windows, etc. Just about every application will benefit from this. It's also incredibly easy to install. Check the website of your mainboard manufacturer for the correct type and amount of RAM that you can purchase for your upgrade. Assuming you followed the diagnostic steps above, you should already know how much physical room you have for RAM on your board. PC-100 SDRAM (note that many mainboards that support PC-100 SDRAM can use PC-133 SDRAM interchangeably, so if you have difficulty finding PC-100 you may have another option), PC-133 SDRAM, PC2100 DDR, PC2700 DDR, and PC3200 DDR. Please also note that DDR-SDRAM is not compatible with plain SDRAM, or vice versa. 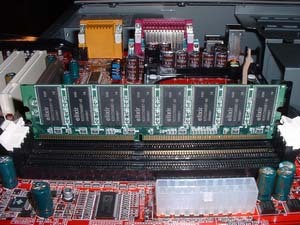 Some mainboards may have separate slots for both, but they cannot be interchanged or used together on the same board. Consult the manufacturer of your board for the correct type. All modern RAM is keyed so it can only fit into the RAM slots a certain way. With modern motherboards, it should not matter which slot you use, though if they are numbered in the manual or on the board, it is always a good idea to go with slot #1 first. Dual channel DDR motherboards will need memory installed in identical pairs, consult the motherboard manual if you are unsure. To install memory, hold the stick of RAM next to the slot so that the indentation(s) on the PCB line up with the bumps in the slot. Once you are certain of the orientation of your RAM, open the levers on either side of the RAM slot and push the stick of RAM straight down into the slot until both levers snap closed on either side of it. This will require some force. If it does not seem to be going in with a moderate amount of force, remove the chip and re-insert it, making sure that it is exactly lined up with the slots. Now power on the computer. Check on the boot up screen and on the properties of 'my computer' in your OS to verify the RAM was installed correctly.